Completely indescribable! And what a stability! I actually thought it was more stable than the seabird, but I think that's because I have a much better connection with the new boat than the seabird. It responded to my every thought, and had unbelievably good speed. I felt that it veered a bit to the right, but discovered that this was because of how I was paddling. New to the Greenland paddle as I am, I had to concentrate to paddle straight. But that was soon in the bag too! I also got some wind and swells coming in from the side, but it felt like the kayak was made just for such conditions. I felt safe all the time! Then it was time to test the rolling capability of the kayak. Since I've only managed a kayak roll ONCE before (half the roll, really, not a 360-degree, if you know what I mean), and that was in the seabird, I had second thoughts. I did a wet exit first, to make sure I could get out of the kayak if everything went to H#ll.. It went well, even though the boat had felt tight when I "put it on" earlier. Then it was rolling time. 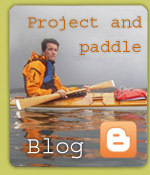 I put the paddle to the side, and pressed my face and chest to the deck. Then I went around. (I used swimming goggles to see where the paddle was, as I haven't paddled with a Greenland paddle before). The rest was pure magic! I don't think I used a single "hip twist" muscle, I just pulled the paddle out, leaned backward on the deck, and I was up again in a trice! INCREDIBLY EASILY ROLLED!! :D It was my first "complete" roll (360), and it worked like a charm the first time! I took a breath, and rolled twice more while I was at it, I did! :D What a boat! When I got back ashore, I had to sit down and look at the boat for a while, admiring the lines and the craftsmanship. Like a work of art. And that's what it is, Anders. A work of art. A proof of traditions, and a reliable person, with skills regular people can only dream about who built this work of art. The Seabird is just a spare boat now. Never again fiberglass. I've found my niche in paddling.